Let’s start off with a brief explanation about why it is justified to dedicate a whole post to a relatively obscure Omega movement. Just as the cal. 33,3 is considered to be one of the all-time great Omega movements, so too is the 30T. The “30” series of movements, of which the 30Ts is the most famous, was first manufactured in 1939. So accurate and reliable was this simple manual movement that it launched a whole family of 15 (and later, 17) jewel movements. The movement went through several evolutions, starting off a rather bare-bones 15-jewel movement before being “upgraded” to a 17-jewel, shock-protected movement with a balance regulated with screws and fitted with a Breguet overcoil balance spring. After 1949, Omega changed their movement nomenclature, and the 30T2 became the 26x-28x series of movements, the final descendant of which is the cal. 286, whose manufacture ceased in 1966, right up to the advent of the quartz crisis. In short, most every manual-winding Omega in this more than 25-year period, from Calatrava-style references to manual-winding Seamasters and Rancheros, all shared the same movement DNA. This sharing of the movement across broad model lines gives rise to a bewildering variety in terms of cases and dials, part of the attraction of collecting these ca. 30T2 models. Though watches powered by the 30T2 were primarily civilian timepieces, both the US and UK militaries issued service timepieces outfitted with that movement. The most famous of these is the Omega CK2292, manufactured to the WWW (watch, wristlet, waterproof) specifications. Watches built to the WWW standard are known as members of the “dirty dozen”. The CK2292, first produced toward the end of WW2, was a watch with railroad markers, printed Arabic numerals, three hands, and (uniquely for a military timepiece) a white dial for legibility, especially at night. The watches, which pilots used to time the synchronized drop of payloads, were regulated to the specifications requested by the British government. According to unverified sources, the British military ordered a total of 110,000 watches, which accounted for more than half of Omega’s total 1943 sales. Of this number, only 3,000 are ref. CK2292, making it a very collectible piece indeed! This movement was likely one of the reasons why Omega was able to build its reputation as a manufacturer of precision timekeeping instruments, a reputation that was further strengthened by the Omega Constellation. In the early 1940s, Omega began to produce a small series of chronometer watches with highly refined versions (designated 30Trg and 30T2SCrg) of the base 30T2 movement, with the “rg” specifying fine regulation. These watches achieved great success at the chronometry trials held in Neuchatel, Geneva, and Kew, where the chronometer-grade watches won the first place “for precision” in 1946. Part of the reason for the movement’s reliability and accuracy lay in its design: the design and layout of the plates was quite different from what other manufacturers were offering at the time. 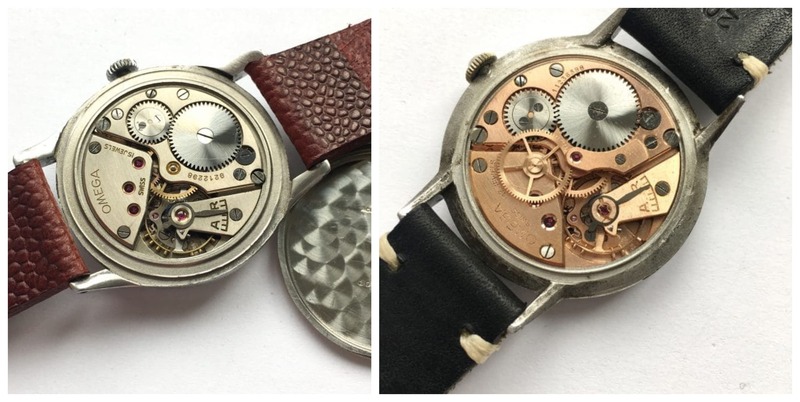 Instead of a “miniaturized pocket watch movement” architecture exhibited in contemporary calibers like the IWC cal. 83, the Omega movement looks almost brutish in its simplicity, with large and functionally finished plates and wheels. The caliber is so elegantly designed that watchmakers apparently still compliment its ease of assembly and durability. Truth be told, it is unfortunate that these watches are getting rarer and rarer to find due to their age. Let us not forget that the oldest of these movements are 70-80 years old. Serviced examples in good working condition are even rarer, as the parts needed to make the repairs are becoming more and more difficult to source. Luckily, Vintage Portfolio has quite a large stock of these highly collectible “Jumbo” style manual-wind calatrava dress pieces. What makes these pieces inherently collectible is their size. The “30” series of calibers was so named because of the 30mm diameter of the base caliber. Due to the size of the caliber, the watches were relatively large compared to their contemporaries, having a diameter between 35mm and 38mm, which makes them a perfect size even today. Discover our selection of vintage Omega 30T2 watches now and make one of these vintage treasures your own so that you can write your own history…. Older →3 Vintage Chronographs Under €2.000!